PPHHHEEEWWW!!! We are all in serious need of deep-tissue massages!! After a week and a half of non-stop artist sourcing, artwork admiring, contacting and e-mailing, and finger-crossing(and a few high fives), we've managed to get our next exhibition 'S P A C E' moving and shaking! Friday, April 26 will see the O P E N I N G N I G H T of our second exhibition! 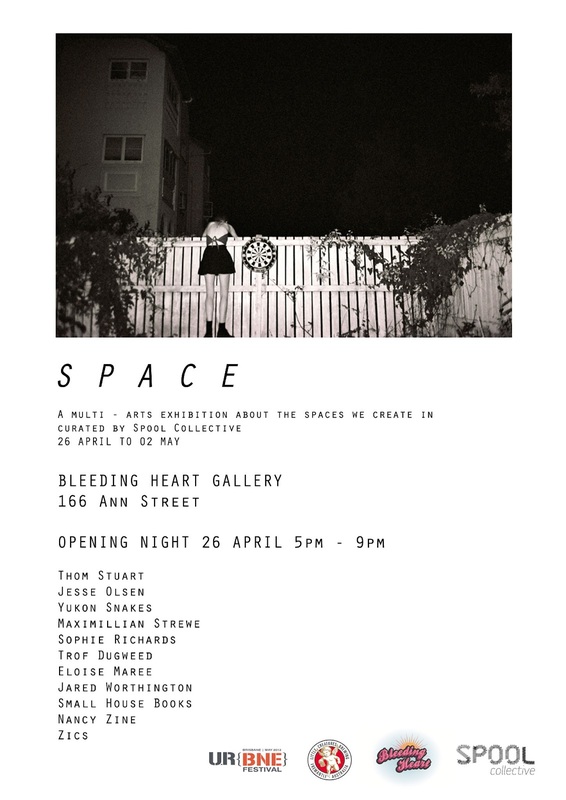 Seven Brisbane artists and three Brisbane zine groups will join us at Bleeding Heart Gallery as part of UR(BNE) Festival for a playful and creative exploration of how our bright little city influences the artists' work. But more important than the city itself are the people in it, so we want to hear from you! 1. What makes Brisbane special and that one-of-a-kind place to live in? 2. What are some of your favourite things to do in Brisbane, places to eat, drink or catch up with friends that you just won't get anywhere else? Take a little time to think, reflect and cherish. We'll see you and your answers on opening night! !